The entire world will be watching on Sept. 12 when Tim Cook officially takes the wraps off of the iPhone 5. 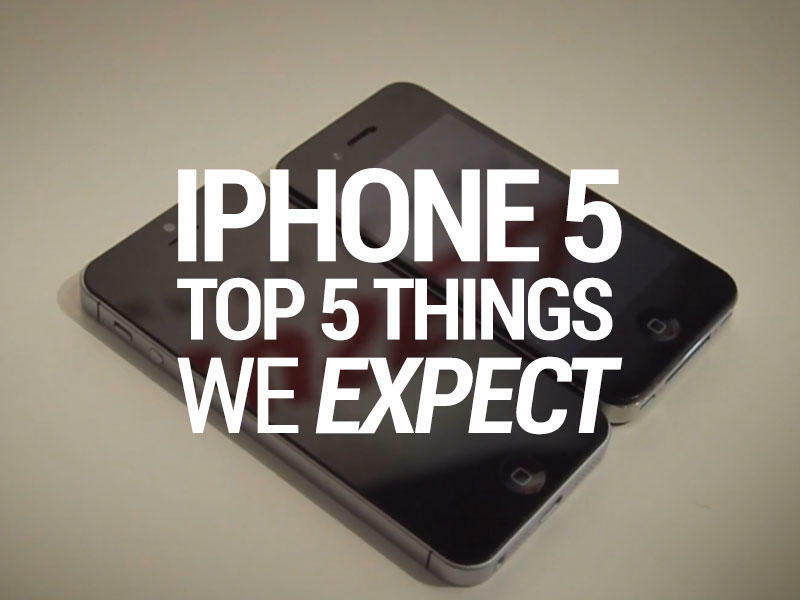 How will it compare to the iPhone 4S? Who will sell it? What kind of new hardware will it offer? Well, thanks to plenty of rumors and leaked shots, we have a pretty good idea of what to expect. I've argued that I don't want the iPhone 5, mainly because I am interested in seeing how Windows Phone and Android evolve over the next year, but there's still a lot to be excited about. And even though there has been a laundry list of leaks, Apple's bound to surprise us one way or another. So what's up its sleeve? Let's examine. No surprise here. Unless you've been backpacking through the Himalayas you're probably aware that the iPhone 5 is expected to offer a larger, thinner 4-inch display. The screen will likely take advantage of in-cell technology, which means you won't need separate panels for the LCD and the touchscreen. We're also expecting a brand new industrial design; likely with aluminum elements replacing the glass back on the iPhone 4 and iPhone 4S. The FaceTime camera will be centered, instead of off to the side, and leaks suggest that the 3.5mm headphone jack will be moved from the top of the phone down to the bottom, next to the 9-pin dock connector. Will Apple improve the camera? Possibly, but we're not betting on it. The iPhone 4S already offers a stellar camera, although we could see some enhancements that improve low light performance. Apple already detailed iOS 6 extensively, and early builds have been available to developers for months now. We already know that Apple will offer enhanced email, new turn-by-turn directions with a fresh 3D Mapping application, Siri upgrades, shared photo streams, Facebook integration and much more. Still, we're expecting the company to announce a few new features that will be available in the final build of the software. We're hoping that means improvements to the notification shade, such as new widgets from third party applications. Or maybe there will be secret additions to Siri that we haven't seen yet. I, for one, would love to see Apple make it easier to manage Wi-Fi/GPS/Bluetooth connections right from the drop-down shade. That feature is already available from unlocked devices, but I think all iOS 6 users could benefit from it. iMessage buddy lists would be pretty awesome, too. In any case, we're betting there are tons of surprises still in store and we can't wait to see what they are. The iPhone 5 needs 4G LTE in order to stay competitive with the slew of other devices that are hitting the market with support for the faster data network. Apple will definitely offer 4G LTE support, in addition to the ability to fall back on slower 3G networks, and The Wall Street Journal recently said the device will support international LTE networks, too. In the United States, that means we'll 4G LTE and HSPA support for AT&T (maybe T-Mobile, although we doubt it) and the ability to fall back from 4G LTE to 3G networks on Sprint and Verizon Wireless. Apple likes to manage its quality control extensively, however, so we're unsure how this will work with Sprint, which still only offers 4G LTE in a handful of markets. It's no surprise the carrier announced today that it will roll out 4G LTE to 100 additional markets in the "coming months." This might seem boring, but it's actually pretty important. If you already own an iPhone, iPod or iPad, you probably have at least one accessory that takes advantage of the 30-pin dock connector port. Maybe it's a set of speakers or a desk or car dock, but you probably don't want to buy that accessory all over again. Apple's new 9-pin connector won't automatically work with those accessories. We're hoping that it provides a free adapter, but it's still unclear if the company will choose to charge a few bucks for it. The 9-pin connector will be smaller than the current generation 30-pin cable, which is a good thing, and may offer a Magsafe connector so that you don't pull your iPhone crashing down to the floor if you trip on the charging cord. The iPhone 4S already offers really solid battery life, but the iPhone 5 will need a larger battery to accommodate for the larger display and 4G LTE connectivity, both of which are a consistent drain on the battery's juice. The most recent rumors suggest that the new pack will be 15% thinner, and also longer, than the current iPhone 4S battery. The iPhone 5 is expected to pack an improved 3.8V/5.45Whr battery as opposed to the current 3.97/5.3Whr pack in the iPhone 4S. Those figures might not mean much to the everyday consumer, but you should expect (and hope) that the new iPhone 5 will get you through a full day of use. We don't think Apple will have a "one more thing" announcement on Sept. 12, mainly because that was a Steve Jobs-era surprise. That doesn't mean Apple won't have a few tricks up its sleeve, however. We hope that NFC is included in the new iPhone, even though recent rumors shot that dream down, mainly because it could work wonderfully with the Passbook feature. Instead of using Passbook to allow airlines to scan your ticket, we imagine a scenario where you could "tap and go" at the gate to check-in. Then, of course, there's the possibility that Apple has been working with Verizon and AT&T on the ISIS mobile payment initiative. Perhaps we'll see NFC packed in but not activated yet, or maybe we'll see it fully functional from the get-go. I've argued that Apple will be the company to take NFC primetime, so I'm really hoping the iPhone 5 offers it. As I said before, I wouldn't rule out the possibility of an improved camera, although I don't see Apple taking it past 8-megapixels just yet. We're all expecting a faster processor, too, although it's unclear what Apple has in store for us. Maybe we'll see the Cortex A9 used again, or even the newer Cortex A15. We have just two days until Apple delivers on, exceeds or fails to meet our expectations. We're willing to bet it exceeds them, mainly because the company has had an entire year to develop its newest flagship smartphone. We'll be hitting you with consistent and breaking coverage all day long on Wednesday, Sept. 12, so keep your browsers pointed to TechnoBuffalo for as much iPhone 5 news as you can handle.